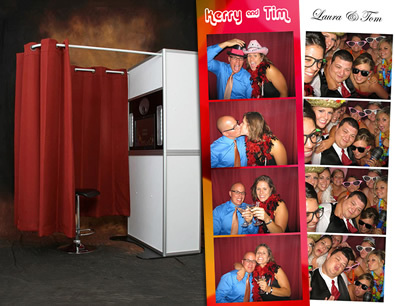 Photo Booths are not only great fun, but they create lasting memories for both you and your guests. Hard At Play delivers a classic design photo booth with one touch simplicity. Our photo booth is self contained and does not have any external printers, cameras, or computers. All your guests have to do is come in, press the button, and the photo booth does the rest. It quickly and quietly delivers a double strip of 4 photos, one for your guests, and another goes in the scrap book that our attendant can create for you. At the end of your event, in addition to your scrap book, you receive a usb thumb drive with all of the photos taken at your event. Lighting that sells the mood! Up-lighting is the easiest way to transform an everyday room into a fantastic, irresistible environment, perfect for hosting any unforgettable event. It can be easily tailored to any event space, as well as to specifically enhance the décor of the affair. By carefully selecting the placement and focus of our array of lights, we can brighten any room and give it an inviting glow that is sure to welcome your guests. You help us choose the colors to complement everything from architecture to floral arrangements to the wedding cake and more. 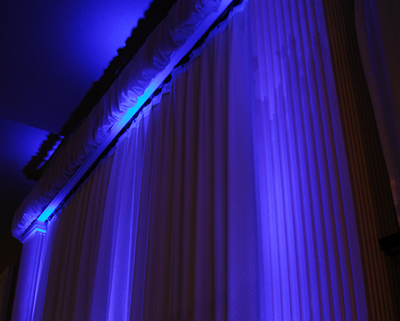 If you want your event space to radiate elegance and sophistication, be sure to add up-lighting to you event! Celebrate with your name in lights! Hard At Play can really help you personalize your wedding reception by creating your own personalized wedding gobo. A gobo is a stencil that is placed on a spotlight and projected onto walls, floors or outdoor spaces to create an absolutely dazzling effect. 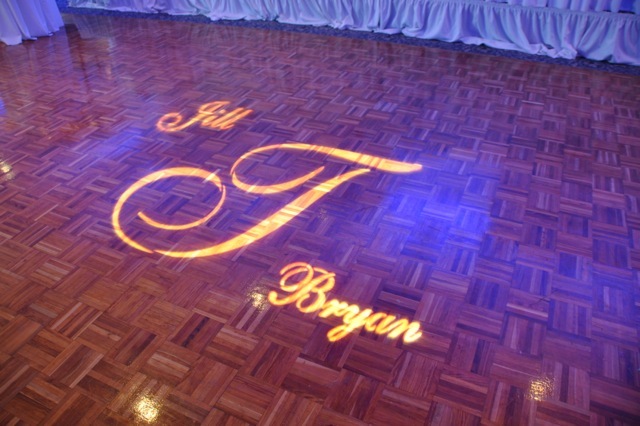 The classiest gobo we encourage you to add projects your name and wedding date, or monogram on the dance floor. Let us even take you to the next level by adding in your wedding color. The creation of such a dramatic visual on the dance floor is definitely a way to keep your guests talking. 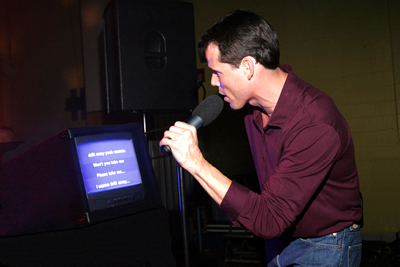 People of all ages dream about having their “moment of fame” while singing their favorite karaoke song. Hard At Play Karaoke can give you that chance in the spotlight! Let your guests sing to their hearts content by adding Karaoke to your celebration. Even better, consider hiring Hard At Play to host your very own Karaoke Idol Party. With our selection of over 16,000+ Karaoke songs ranging from Sinatra to Shakira, we definitely have a song for everyone! Piecing it all together for you! From your earliest memories to your newest memories, Hard At Play will take the captured photo moments that you’ve hand selected and set them to music, and project them via either large projection screen or plasma screen display. Undoubtedly the most sentimental way for all of your guests to share in the time that has past to bring the two of you together. This presentation is sure not to leave any of your guests with a dry eye. Trust Hard at Play to furnish it all! Look to Hard At Play for wide range of audio and video support for every application. Utilize our mixers, sound systems, plasma screens, projectors and large screens for your next corporate event, presentation, dance recital or even drive in movie! From 30 to 30,000 trust Hard At Play to furnish it all. Entertaining the senses is a key element in planning a great event. Lighting is the most effective way to easily create an atmosphere full of energy and excitement! From our standard lighting effect which produces 30 beams of multi-color light that rotates and crisscross to the music, to our full scale all out mobile club look with intelligent lights powerful enough to fill the largest venues with a dazzling display of effects. This constant swarm of more than 80 color gobo beams creates an explosion of color and light. Our lighting inventory consists of top of the line effects by the most respected name in professional lighting. We’ll help you pick the right lighting for your event that is sure to create a feast for the eyes!